4111 ⊙ 13Ia 5 Rp. 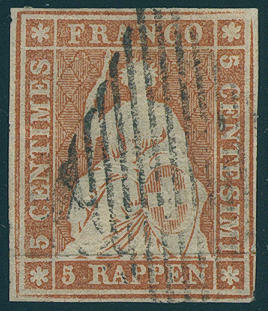 Red-brown, first Munich printing, wonderful fresh colors, on all sides white margined with black Federal lozenge, especially nice and neat cancelled an outstanding quality this Switzerland rarity for the highest standards! Photo expertize \"genuine and immaculate, outstanding condition\" Eichele. 4112 ⊙ 13Ia 5 Rp. Red-brown, 1. Munich printing, with white margins on two sides, fresh colors with black Federal lozenge in perfect condition, photo expertize \"genuine and immaculate\" Eichele. SBK 2250,- Sfr. 4113 ✉ 13Ia 5 Rp. Orange brown, 1. 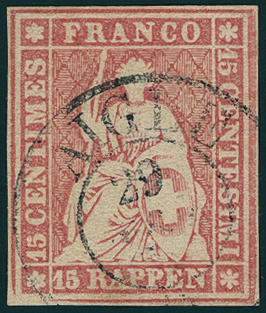 Munich printing, spectacular multiple franking of three copies, all values wonderful fresh colors, good to broadloom margins, partial from margin of sheet, middle stamp with missing silk thread, on very nice cover with two clean mounted confederate lozenges and additional single circle postmark \"REINACH 17. AVRIL. 55\", 2. Weight step, to Liestal. Margin copies of this issue are already lots hardly to find. 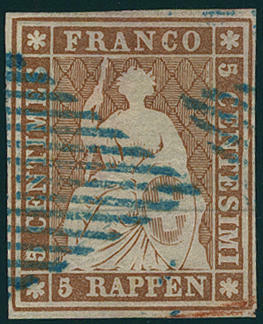 A such extremely scarce franking with besides two margin copies in this exception-quality counts to the all large rarities the Strubel issues. A Honor for the sophisticated special collection! Photo expertize Rellstab / SBPV. 4114 ⊙ 13Ib 5 Rp. Brown, 2. Munich printing, wonderful having bright colors outstanding quality, large margins all around with clear blue Alliance rhombus, an exception copy, expertized Nussbaum, photo expertize Eichele. (SBK no. 22 A). 4115 ✉ 13IIByma 5 Rp. Brown, Bern printing, 4. 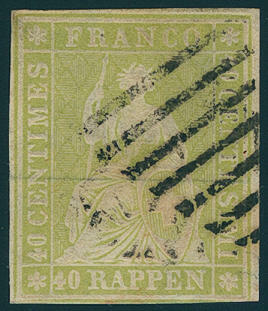 Printing period, green silk thread, on all sides white margined with parts from four neighbors on very nice, small-format cover with clear single circle postmark \"GENEVE 28. DECE. 60. \" to Servette. An exception letter for the highest standards! Expertized Cueni, photo expertize \"genuine and immaculate\" Eichele / SBPV. 4116 14Ib 10 Rp. 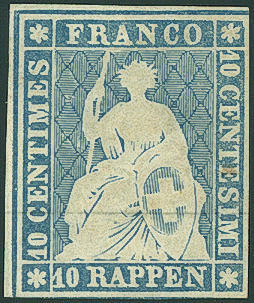 Medium blue, Munich printing, wonderful fresh colors, two-sided white margined, otherwise touched lightly, with original gumming. A very nice copy this Switzerland rarity! Photo expertize Rellstab. Michel 4500,- €. 4117 ∆ 14Ib 10 Rp. Medium blue, 1. Munich printing, horizontal pair wonderful fresh colors and on all sides full margins on decorative letter piece with clear rectangle cancel \"PD\" from Zurzach in special form. A very nice pair in good condition. Photo expertize Rellstab BPP. 4118 ✉ 15IIbym 15 Rp. 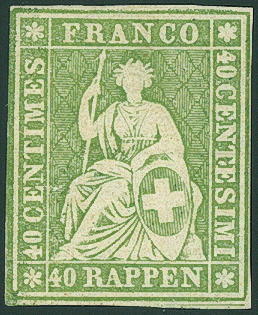 Rose, Bern printing, thick paper, green silk thread, vertical pair wonderful fresh colors, on all sides full to having huge margins with parts the neighbour stamps, to the quality check disengaged, on beautiful registered cover with clear thimble single circle postmark \"St. Gallen 12. June 62\" to Marbach / Rhine valley. All postmarks are especially nice and clear mounted. A letter in outstanding quality for the highest standards. Photo expertize from the Weid. 4119 ⊙ 15IIByma 15 Rp. 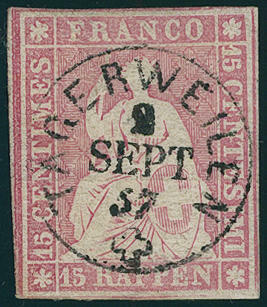 Rose, last Bern printing, in perfect condition with perfect centered clear thimble cancel \"TÄGERWEILEN 2. September 57. \". Outstanding quality! Photo expertize Eichele. 4120 ⊙ 15IIByma 15 Rp. Rose, last Bern printing, wonderful having bright colors and on all sides white margined outstanding quality with clear two ring cancel \"AIGLE\" (SBK no. 24 D). Photo expertize Eichele. 4121 ✉ 16IIAzm,17IIAyr 20 Rp. Yellow orange, thin paper, first printing period with 40 Rp. 2. 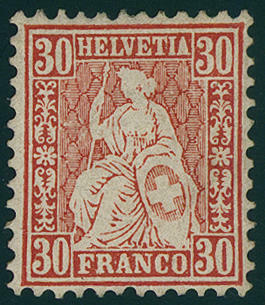 Bern printing, both values wonderful fresh colors and good margins on decorative registered cover from \"Zurich 2. 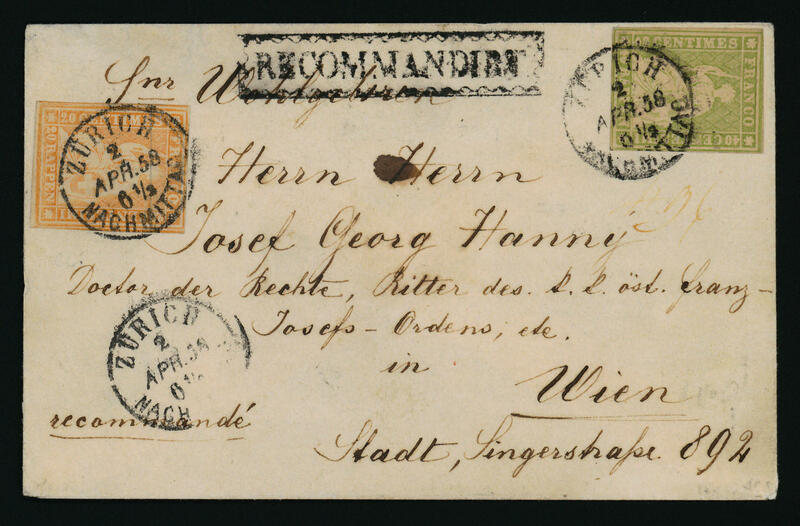 April 58\" with decorative devotion address to Vienna with arrival postmark. 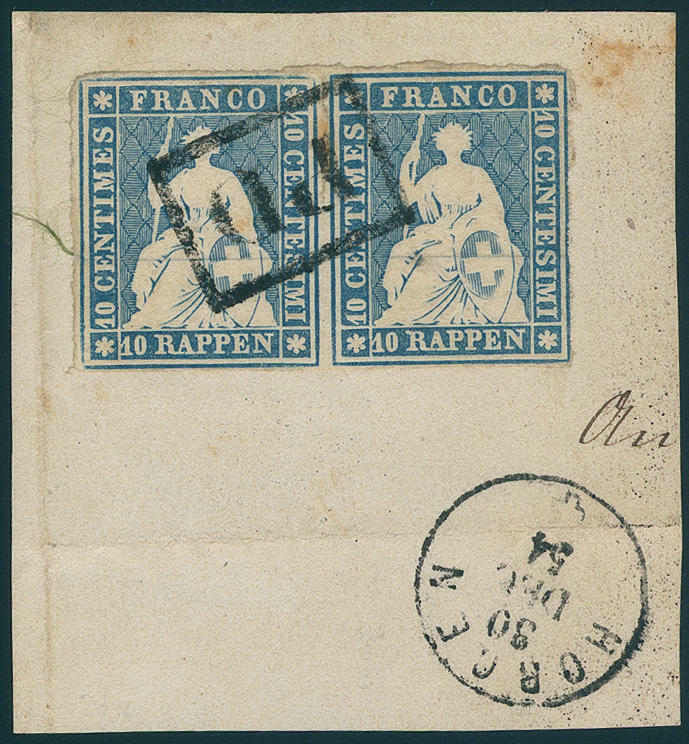 An exceptional nice foreign countries registered cover with very rare franking! Photo expertize Moser-Räz. (Zst. No. 25 Fb, 26 approximate). 4122 ⊙ 17Ia 40 Rp. Pale yellow green, 1. Munich printing, fresh colors and on all sides white margined with clean mounted black wide lined Genevan lozenge. An outstanding quality for high standards! Photo expertize \"genuine and immaculate, outstanding condition\" Eichele. 4123 ⊙ 17Ib 40 Rp. Green, 3. Munich printing, horizontal pair, wonderful fresh colors in perfect condition with two clean mounted black confederate lozenges, a decorative and scarce unit, expertized Diena, photo expertize Eichele. Michel 1300,- €. 4124 ⊙ 17Ib 40 Rp. Dark yellowish green, 2. Munich printing, fresh colors and in perfect condition with black clear Alliance rhombus, photo expertize Eichele. Michel 550,- €. 4125 17IIBym 40 Rp. Green, Bern printing, 4. Printing period, wonderful fresh colors and good margins, in perfect condition mint never hinged in utterly perfect condition. 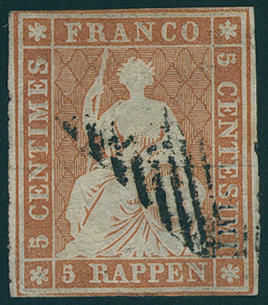 Unused examples of this stamp are nearly always without gum to find. 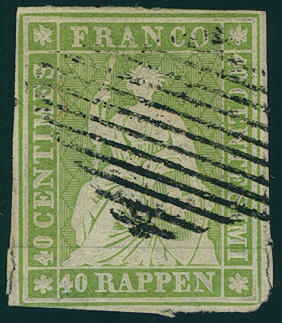 In mint never hinged condition is an important rarity of this issue for the highest standards! (Zumstein no. 26 G). Photo expertize \"in excellent condition\" von der Weid. 4126 ✉ 18IIAys 1 Fr. Violet gray, Bern printing, 40 Rp. Green, as well 20 Rp. 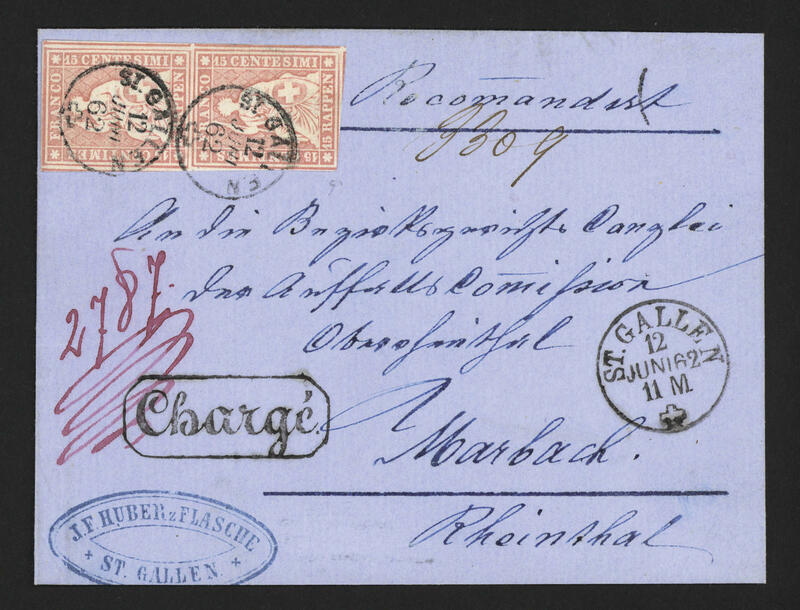 Orange, Munich printing, as wonderful three colours franking, wonderful fresh colors, mixed cut, on cover with clear single circle postmark \"BERN 15. 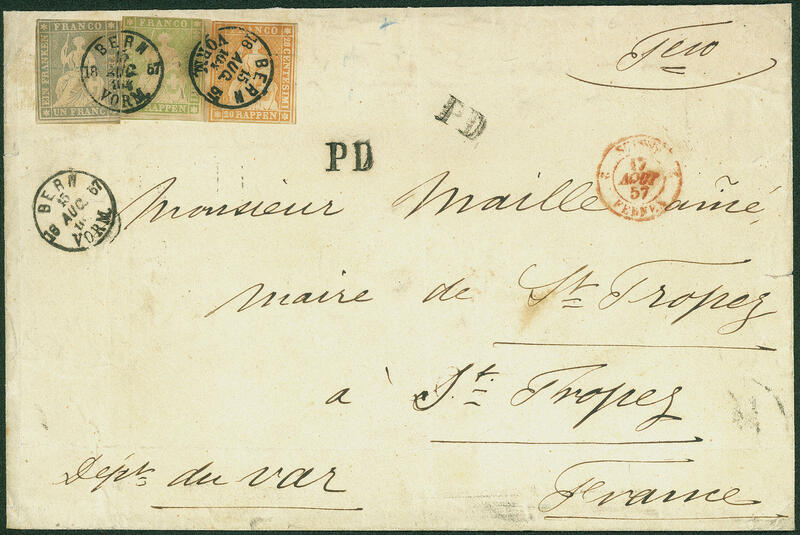 August 1867\" with additional one-line cancel \"PD\" and red border transit postmark to \"ST. TROPEZ / France\" with transit and arrival postmarks. An especially decorative and very scarce franking! (Zumstein no. 25 Ba, 26 approximate, 27 approximate). Photo expertise Trüssel. 4127 ∆ 18IIAysa 1 Fr. 2. 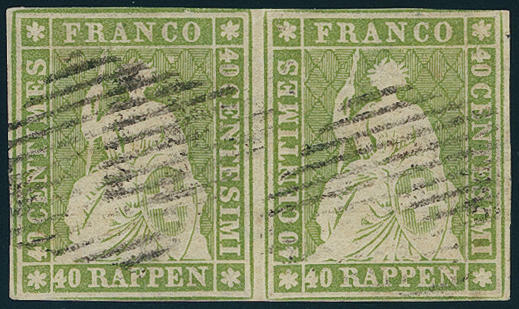 Bern printing, vertical pair on piece, small faults, a scarce unit, photo expertize Eichele. Michel 1800,- €. 4128 ✉ 24b,27,28a 20 Rp. Orange, 60 Rp. Copper bronze and 1 Fr. 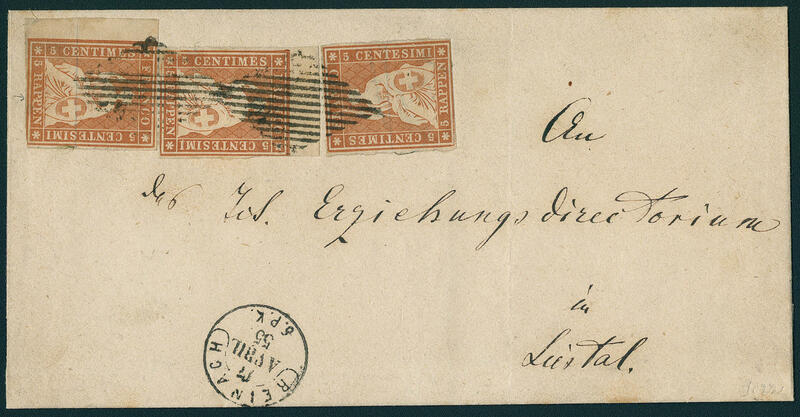 Ormolu (red-brown background) as beautiful and scarce three colours franking on magnificent cover from \"LAUSANNE 21. OCT. 64. 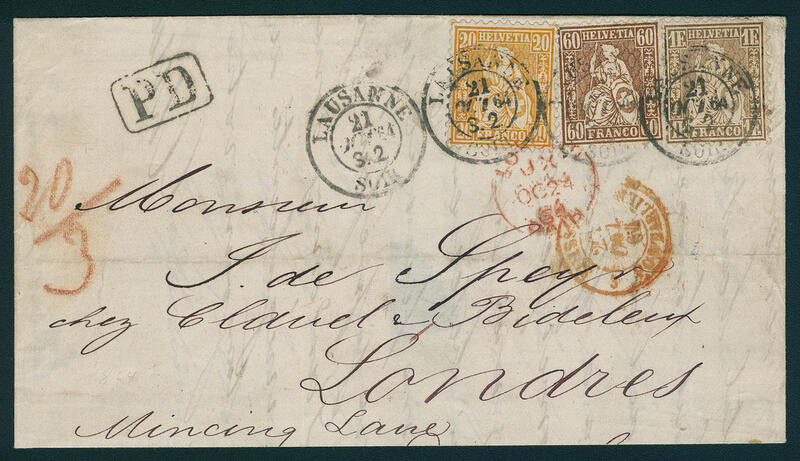 \" to London with transit and arrival postmarks. All stamps are wonderful fresh colors and well perforated. A more desirable cover this franking rarity! Photo expertize Renggli. 4129 25 30 C. Vermilion, seated Helvetia, fresh colors and very well perforated, in perfect condition unused. SBK 2400,- Sfr. 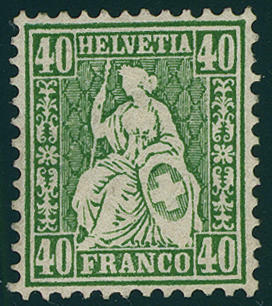 4130 26 40 C. Seated Helvetia, wonderful having bright colors, excellent perforated and centered unused outstanding quality, signed Stolow. SBK 2200,- Sfr.